Marussia followed in Caterham’s footsteps for the first few seasons of their F1 career but they broke free in 2013 and moved ahead of their backmarker rivals for the first time. Their stock was on the rise in 2014, but Bianchi's terrible crash was followed by the team going into administration. They managed to continue on until the end of the 2016 season, but money troubles were never far from the door, and the team officially folded in January 2017. As one of the new entrants to Formula One in 2010, Manor Motorsport and Wirth Research came together to create Manor Grand Prix. The name never quite reached the paddock, as the Virgin superbrand came in. The company secured 80% of the team and took naming rights. Virgin Racing participated in two seasons, 2010 and 2011, finishing twelfth overall in both, and without taking a single point. At the end of 2010, they were bought by Russian sportscar makers Marussia, and were rebranded as Marussia F1 for 2012. During the 2011 season, the team split from Wirth Research after finding their CFD-only method of development didn’t deliver the required results. As the battle of the backmarkers was initially a point-less endeavour, the fight for tenth in the championship raged between Marussia and Caterham. In 2012, a highlight twelfth place finish saw them jump above their rivals in the standings, but they were pipped to tenth in the final race at Brazil, when the attrition rate saw them again twelfth but with a Caterham just in front. Ahead of the 2013 season, the team signed Brazilian driver Luiz Razia, but they released him from his contract after admitting they needed more resources to survive as a team. Instead, they brought in Jules Bianchi who initially proved to be very fast. They managed an early result of 13th which moved them into tenth place, and the team spent the rest of the season holding their breath and hoping it wouldn’t be snatched away from them. This time, they secured the coveted position, celebrating their highest standings finish to date. For 2014, Marussia were one of only two drivers to retain their driver line-up from the previous season, with Jules Bianchi and Max Chilton providing them some consistency. They started well, and Bianchi gave them something to celebrate by securing the team's first points in Formula One during the Monaco Grand Prix weekend. However, there was also sadness during the year, as Jules Bianchi suffered a serious head injury after a crash in Japan. Coming to terms with their injured driver, the team tried to battle on, but found themselves going into administration before the end of the season. After an uncertain winter of trying to find backing, the team confirmed they would come out of administration in mid-February and would be able to participate in the 2015 F1 season if they could use the previous year's car. That suggestion was at first rejected by the other teams, but a compromise was reached. Under the revised name, Manor Marussia, the team arrived in Australia but were unable to participate in any of the sessions or the race due to a software issue on the car. They came under fire from Bernie Ecclestone who criticised the outfit for never having any intention to race at Albert Park, but the team patched themselves up and took to the track for the second round in Malaysia. After another difficult season, the team ended the year unsure of their future once more. However, ahead of 2016, the team restructured and returned to their Manor GP roots. There were celebrations aplenty when the team achieved a tenth place finish in Austria and picked up their first point of the season. However, Sauber managed a ninth place right at the end of the season which moved them ahead of Manor and dropped them out of contention for funding. With that in mind, team owner Stephen Fitzpatrick put the squad into administration at the end of the year, leaving Manor's future in doubt once more. Efforts were made to find a buyer for the squad, but unfortunately there were no sustainable bids, and so the team officially closed its doors in January 2017. Learn more about Marussia with the Pocket F1 Handbook. 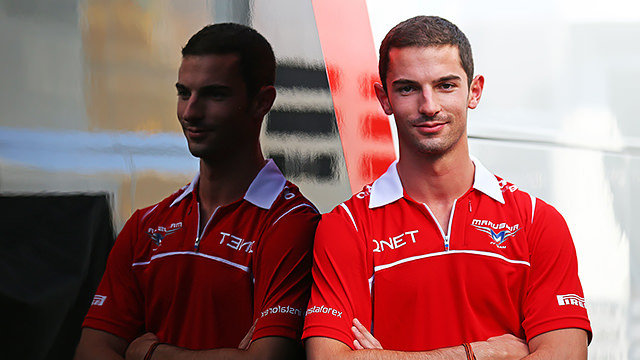 Alexander Rossi, the reserve driver who recently bailed from duties at the struggling Caterham outfit, has today been confirmed as third driver for the Marussia F1 team. Rossi is pleased to have found himself a new home in F1 so quickly. "The timing of my affiliation with the team is perfect, especially beginning in Hungary before the summer break. My goal is Formula One, and I’m delighted to be immersed into the team as official reserve driver, where I have the opportunity to prepare for this next step, with plans to drive in Free Practice 1 this season."